An interview with Miami Herald sportswriter Manny Navarro. Whether your team is of the Orange and Green or of the Orange and Blue. Whether you watched them play in the old Orange Bowl or the faux Orange Bowl. A little bit of football magic probably dies this Saturday. Prepare to say so long to the tradition of the Miami Hurricanes vs. the Florida Gators. Or, to be fair (and safe,) the Florida Gators vs. the Miami Hurricanes. Some years the Hurricanes blew away the University of Florida. Other Saturdays, the Gators took a bite out of the men of Coral Gables. And, with all due respect to the Florida State Seminoles, a second cross-state honest-to-goodness-hate-'em-'til-you-die rivalry developed between the two teams. But conference-play cash has proved too much to pass up and the City Slickers and the Gainesville Hickers are calling it quits. No more penciling each other in on their fall football dance cards. And even if these two nationally-recognized Florida teams never face each other on the regular season football field again, it's probably safe to say -- they will always agree to disagree. Regardless of who wins this Saturday, it is the fans who suffer the loss. Kickoff for the BCS championship game between Alabama and Notre Dame happens at 8:30 tonight. But fans from both teams have been showing their colors across Miami and South Florida all weekend. The squiggly line seemed to show up out of nowhere. It happened at the Greensboro Coliseum on Sunday, March 17th. Confetti was falling. Hurricanes were celebrating. The University of Miami had made history by winning the first Atlantic Coast Conference tournament in school history. 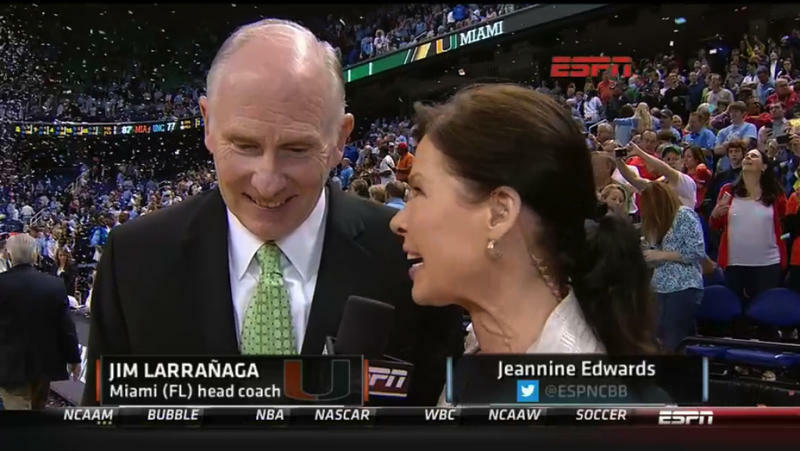 Jeannine Edwards, an ESPN reporter, was standing by with second-year UM coach Jim Larranaga. And then, the name graphic.